The Antares rocket is raised onto the launch pad at the Mid-Atlantic Regional Spaceport in NASA's Wallops Flight Facility on Oct. 14. 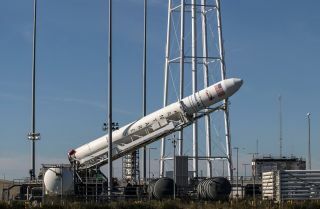 Update for Sunday, Oct. 16 at 3 p.m. EDT: NASA and Orbtial ATK have delayed the Antares launch by 24 hours to Monday (Oct. 17) at 7:40 p.m. EDT (2340 GMT) due to a glitch with ground support equipment. Orbital ATK's Antares rocket has left the building! The Antares rocket reached its seaside launchpad on Wallops Island, Virginia on Thursday (Oct. 13) ahead of a planned cargo delivery mission to the International Space Station for NASA. It is scheduled to launch an Orbtial ATK-built Cygnus cargo ship to the station on Sunday (Oct. 16) at 8:03 p.m. EDT (0003 Oct. 17 GMT) from the Mid-Atlantic Regional Spaceport at NASA's Wallops Flight Facility on Wallops Island. The launch was delayed from a Friday liftoff due to the impact of Hurricane Nicole at a mission tracking station in Bermuda. Orbital ATK's Antares rocket, with the Cygnus spacecraft onboard, rolls out of the Horizontal Integration Facility at NASA's Wallops Flight Facility in Virginia on Thursday (Oct. 13), beginning its half-mile journey to the launch pad. In a photo taken Wednesday (Oct. 12), the rocket is departing the Horizontal Integration Facility, where the different parts of the multistage rocket are connected. Here, the two-stage Antares was recently paired with the Cygnus spacecraft, a pressurized cargo module that can carry up to 5,952 pounds (2,700 kilograms) of payload to the space station. This mission, labeled CRS OA-5, will be Orbital ATK's sixth unmanned cargo supply mission and the seventh planned flight for its Cygnus spacecraft. Its fourth planned launch ended in a fiery explosion in October 2014. The private aerospace company is contracted by NASA to fly these missions to the space station.